My name is Liudmyla Heggland. I live on Rennesoy Island, Norway. I was born in Ukraine and started beading in the middle '90s. All my skills in beading have grown with big help of the internet. 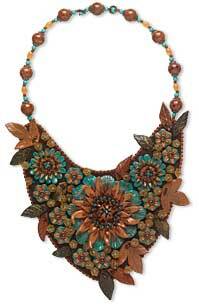 Best samples of brilliant bead artists gave me inspiration to create lots of bead woven and embroidered pieces. In 2002 I submitted my embroidery necklace, "In Cold Land," in the Bead and Button Bead Dreams contest and my work went to the finals. But a couple of years ago I discovered a very interesting material--polymer clay. I decided to make some beads and elements in fimo or cernit. But now this is my main material to work with. Beads are just perfect additions to my new polymer projects. Once I bought bricks of Kato Polyclay from Fire Mountain Gems and it was a wonderful experience in my life. I like to make new shapes and colors in my works. Actually I like to learn more and more every day. Most of all, I am inspired by flowers and plants, and the beauty of nature. That is why my work, The Autumn Twilight is full of flowers. Flowers was on my work "Golden Autumn," which was a finalist in the Bead Dreams 2009. Sea Slugs was my second place winning work in the Bead Dreams 2010. I adore nature and I hope to always get inspiration from it. View all of Liudmyla's designs in the Gallery of Designs.